This is a four-part major series on New Zealand’s wines. Part I throws the spotlight on New Zealand’s hottest wine topicsPart II focuses on New Zealand’s North Island, part III visits the South Island. 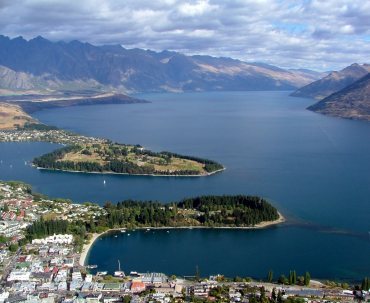 I visited New Zealand in January/February 2006, when I was lucky enough to be invited as a guest of the Central Otago Pinot Noir Celebration, an absolutely terrifc bi-annual event held in and around beautiful Queenstown (pictured right) and the Central Otago vineyards. The event celebrates Pinot not just from the local vineyards, but from around the world.The Celebration runs over two days, with tastings, dinners, seminars and a generally excellent time had by all. It is open to the public and there were visiting Pinot enthusiasts there from as far afield as the UK and the USA. You can read about the celebration at its web site. but it is a unique event with fantastic food and wine, lovely people, and the most beautiful setting. The two days of the celebration were filled with tasting Central Otago Pinot, but on the day before things kicked off, the organisers very generously arranged a tasting of 100 New Zealand Pinots from other regions for the four invited press guests: myself, Joelle Thomson from New Zealand, Allen Meadows from the US and Huon Hooke from Australia. This tasting was totally blind, and arranged by region, in the order presented below. Around another 30 Pinots tasted at regional tastings and winery visits have been added to the list below. Nice minerality here, with a deal of cherry fruit. Quite a lean palate, with a tight cherry quality. Perhaps a little lean. Big mint toffee nose, with plenty of new oak showing through. The fruit on the palate is quite rich and ripe, with a nice plummy quality to it. There’s a liquoricy edge, but tangy finish. Another slightly lean, metallic light cherry fruit. Perhaps just very young. On the palate some nice fruit sweetness and very decisive tannins. This has some charry, sweet toasty notes. A touch of gaminess here too. On the palate decent fruit and balance, with a reasonable quality, plenty of acid. Slightly more vegetal, beetrooty, perhaps rather more mature aromas with an earthy and herbal note. Nice fruit here, and plenty of background richness. Lovely finish with orangy acidity coming through. More cedary oak here, with a smooth, rich and mellow character and some depth and breadth. Slightly edgy palate, with a touch of liquorice and bittersweet fruit. Lacks a little light and space. Softer, more muted and slightly creamy nose. A little touch of baked plum pie. On the palate rather tight and firm at present, with very concentrated cherry fruit and a lick of espresso, then tight, quite incisive tannins and acidity. Very good, but dense. Smoky, charry, quite toasted aromas with a nice earthiness and Pinot character. Palate is lovely here – lots of generous, cherry and softer strawberry fruit notes, with a rounding out of mellow oak and a firm tannic background, where sweet vanilla and toast play against firm acids. Lighter, slightly medicinal cherry note. The palate is firm and fairly lean and linear, without much texture and with quite firm tannins. Slightly muted nose with a little backed quality. Just slightly plummy and dense. On the palate a big, expansive texture that is quite mouthfilling, with lots of juicy acidity and flavoursome, if a little compacted and too tight. Promising though. A solid feel about the nose here, with a baked and plummy quality coming through. Sweet fruit, and pretty dense though, but has it enough charm? plummy quality comes throughy. Definitey a richer style, but tangy, and successful. More charm here, with softer, more open and textured appeal with earth and sweet fruit. Lovely fruit on the palate here that is tangy and bright, with not a lot of oak influence keeping it crisp. Perhaps a touch lean through the mid palate, then some spicy oak in the finish. Vanilla and quite ripe fruit notes. A touch of earthier character. The fruit is very sweet and quite rich on the palate, with an edge of sweetness and plenty of acidity to counterbalance. There’s a red liquorice bittersweet quality and a rounding touch of charry oak. Quite a herbal, leafy quality at first, with a touch of creamy oak. The palate has a nice solid quality of ripe berry and red cherry fruit. Nice quality, silky mouthfeel, perhaps a tiny metallic note in the finish. More developed, gently truffly nose, with a sweet oak note and plenty of soft red fruits. The palate here has lots of juiciness and good sweet fruit. Nicely balanced finish. Lots of vivid fruit here, with cherry and red plum notes and a nice fruity forward character. There’s a hint of earthy minerality too. Really vivid and bright fruit on the palate, with a lovely punchy fruit quality and the sweetness shining through. Long, mouth filling and well balanced. Slightly dull, slightly metallic note (tiny touch of brett?) On the palate decent fruit, though a little bit non-descript. Juicy enough, but spoiled by that slightly metallic edge. Nice nose here, with a tobacco and earthy, slightly schisty quality. I like the fruit quality here, with a rounded, savoury edge to sweet fruit, with plenty of acidity and a nice soft tannic structure. Toasty and warming lightly fudge notes and quite sweet plummy fruit. On the palate this has a slightly dull character, with a Beaujolais like hardness and minerality. From Waipara, and quite young vines this has quite a silky, plush nose with spicy wood aromas and incense. There’s a strawberry softness to the fruit, but quite a crisp cherry quality on the palate, with a good texture and weight on the mid-palate. Firm, quite edgy and liquoricy cherry fruit – very firm fruit on the palate too, with touches of fennel and kirsch-like notes, if a little firm and ungiving. Big, toasty espresso nose, with rich red fruits, and plenty of oomph. The palate has fine fruit and an earthy, slightly chocolaty feel before quiet rough tannins and an edge along with crisp acidity. Tangy and spicy into the finish. Not absolutely harmonious, but lovely life and personality. I like the toastiness and richness of the fruit here, with vanilla and a touch of coffee. On the palate it has very good fruit quality, with a solid core of fruit, and decent weight and length. Very vibrant, very youthful, with vivid cherry and rose hip and minerality. Appealing. On the palate a burst of very juicy, rich, burstingly fresh fruit baked up by a weight of charry oak. Not integrated, but should come together very well. A touch of meat stock and gravy character on the nose, with a little bit of beetroot and a mild green note. The palate has quite a lean, herbal quality too, with some earthy, schisty quality. There is zest and zing, but has a little bit too much alcohol and possibly a little bit too much sugar. A more reserved, closed character. The palate has nice juiciness, but it is a bit lean with rather biting orangy acidity. Rather baked aromas. Fruit is decent on the palate, but doesn’t distinguish. Tiny note of brett, with cherry and slightly metallic fruit. The palate has rather a nice fruit quality. Bitter black cherry and damson fruit, and a liquoricy stripe of tannins. Quite long and spicy finish. Vinous nose, with some cherry aromas and again I just suspect a touch of brett, but nice vanillin sweetness. comes through Very tangy palate, where the fruit is good and there is firm, juicy structure. Should age nicely. Quite rounded and fruity, with a fair amount of rich, rounded fruit character. Smoky nose, with an earthy, tobacco-tinged sweetness of fruit. Vivid black cherry on the palate is quite mouthfilling, with a dry tannin evolving in the finish, good acidity and pretty good length. Very fine coffee-tinged nose of ripe cherry fruit, with a plummy roundess and plenty of earthy, quite mineral qualities. On the palate there’s a liquorice edge to the fruit, with plummy concentration. There is a rounded, full quality here, with very good concentration and a lovely acid structure. An earthy, quite sweet roundness and good fruit quality here. A little bit of light and shade about it. Juicy palate too, with long acids extending the finish. Spicy, promising. Quite fat, sweet fruit with good character. Tasty palate, with a savoury mineral and earthy note joining bright fruit. Firm, quite Beaujolais-like qualities, with firm cherry and mineral aromas and more of the same on the palate. Very light colour. Soft, expressive red fruit. Quite gently strawberry and raspberry character. Lightweight drinking, perhaps just lacking a little fruit? Nice cherry fruit, but another with a touch of brett. Brett spoils otherwise beautifully ripe and pure, bright fruit. Rather insipid nose. A bit lean and ungiving, but does open up and becomes slightly more expressive. Decent palate, decent fruit. Really quite mineral, with firm cherry fruit qualities. This has decent fruit, though is perhaps a touch linear. A little bit of baked plum, a little vegetal note. The fruit sweetness and ripeness is good on the palate, with a core of ripe cherry and red berries, though perhaps lacks a little generosity in the finish. Quite a tight, focused red fruit nose. Plenty of tangy, tight and juicy red fruits. This comes through well, with plenty of mid-palate ripeness and plenty of juicy, sweet fruit that is nicely balanced with spice, tight tannins and fresh acidity. Open, lighter, more expressive Pinot, with lighter colour and lighter, strawberry aromas. A little vanilla and toast adds interest. Lovely palate here, with charming fruit, nice espresso notes and fine acidity. Lovely. Slightly dank, slightly stinky aromas. A little vegetal and Roquefort character. On the palate this has some decent liquorice and black cherry skin, slightly tart fruit, and a nice supporting acidity that is a touch lean. Perhaps a little touch of sulphur, but also a good minerality. The palate has good sweetness, and there’s a juiciness about this, with a real blast of tangerine acidity. Vanilla and quite ripe fruit notes. A touch of earthier character. The fruit is very sweet and quite rich on the palate, with an edge of sweetness and plenty of acidity to counterbalance. There’s a red liquorice bittersweet quality and a rounding touch of cedary oak. Earthy, mushroomy, quite vegetal, and a touch of brett. Palate is OK, with some decent fruit. Vanillin oak and touches of fine, vegetal quality. Decent red fruit, with crisp acids. Perhaps a touch lean, but has a nice drying finish. Perhaps tiring slightly. A little Dank and weedy, dill like character. Very sweet fruit on the palate, with a good deal of ripe, rich berry fruit. This is a nice wine. Perhaps a touch closed, a touch sulphury, with a red fruity character coming through, and some juiciness. Lovely herbal dill and thyme qualities. Good fruit, quite focused and bright, with enough juicy acids and plumskin to give an edge. Decent fruit, quiet crisp and cherryish, with a slick of vanillin and decent edgy, liquoricy acidity. Lovely nose here, with really nice ripe, rich, bursting cherry and red berry fruits. A touch of cassis. On the palate smoky and chocolaty notes are added to good fruit and this has fine bittersweet finish. Rounded, solid, big and sweet nose, with a certain solidity, but still some elegance. On the palate sweet-edged and juicy, and has a good acid balance. Very juicy and appealing. Quite a decent schisty quality to the minerality here. This has a nice vinosity, and a nice palate of light, herb and cherry-edged fruit. Very appealing in a lighter, more elegant style. Custardy, ripe and full oak, with quite ripe, rounded fruit. Nice weight here, and nice sweetness of fruit, with elegant tannins, a bit of spice and good quality generally. Quite a nice cherryish fruit. The palate has some real elegance, with a grip of fine tannin and some ripe cherry acidity. Crisp and fruity. Much lighter colour, with very fine aromatics. This has nice chewy tannins and an elegance of fruit, and although it is fairly rustic, is very enjoyable. Light, silky, gently earthy fruit. There is terrific fruit sweetness here, with a great deal of attractive, elegant finesse. The palate is perhaps a little light, but there’s tobacco and a nice smoky soft fruit and tobacco finish. Quite solid, fine fruit flavours, with a juicy orange character and a bright fruitiness. This has good fruit, and plenty of attractive, light but sweet and rounded fruit, and balanced acids with a fine, warming toasty character. A tiny hint of brett, and modest fruit, with some herbal qualities. On the palate it has good fruit, but that touch of mousey, metallic flavour creeps in and spoils it slightly for me. Quite subtle, but powerfully fruity nose, with a deep well of plum and damson fruit. Quite fine vanillin background. On the palate terrific fruit sweetness, with a dry, fine tannin structure and plenty of crisp tannins. Nice roughening edge. Very composed and classy nose, with a touch of herbs, plum and sweet fruit. Sweet, full, very mouthfilling fruit, with plenty of ripeness and mid-palate weight. Lovely oak integration and length. Nice oak character on the nose here – really cedary, a touch herbal. Palate of juicy fruit, with a stripe of lean tannins and red fruits, licked with liquorice. Spicy and rich in the finish, is it perhaps a touch alcoholic? Quite charry and deep, with espresso notes and a dark fruit quality. Good concentration and weight here, and a nice chocolaty richness on the palate. Smooth, silky and quite powerful, with excellent fruit sweetness. Quiet a high-toned oak component, and very sweet, ripe fruit. Delightful strawberry fruited ripeness, and the finish displays plenty of liquoricy bite and fine, plush tannic structure. A touch of creamy, slightly toasty oak. A little bit earthy and schisty. Fine cherry fruit. Good length, and a soft vanillin finish. A slightly lean nose, with not so much oak or depth of fruit. Ripe enough, and good acids, if perhaps a little astringent. Quiet schisty and fine, with a well-delineated mineral and cherry fruit. On the palate more of the same, with tight liquoricy tannins and a lean, savoury edge that makes this very moreish. Smoky, ripe and rich with a touch of tobacco. Sweet fruit, and has a richer, riper component than some, but very delicious. Big, soft, oaky finish. Chocolate and fudge notes dominate, in a very smoky, richly oaked style. Real fruit richness and sweetness, with plenty of fruit and good balance. There is something nutty, if a little muted and closed about his on the nose. The palate is rather lean and underfruited. Quite a dank quality, and a touch vegetal and mushroomy. The palate does have a fresh, vividly fruity character, which is fine, with a bit of chocolate and a touch of zesty lemony acidity in quite an appealing wine. Very sweet, soft, vanillin-licked red berry fruit. The palate has spice and a nice peppery zest to it, with fresh fruit and a touch of earthy, quite chocolaty character. Very attractive. Porty, quite rich and alcoholic nose, with a little stewed prune. Similarly raisined and stewed fruit on the palate. Big espresso bean and coffee nose, with solid red fruit beneath. On the palate this has good fruit that retains freshness and has good balance and a lightness about it. Long and elegant. Plenty of ripe, warming, deliciously rich fruit. Plenty of weight and sweet, svelte texture on the palate. Good fruit, with sufficient acidity and fine, chocolaty tannins. Easy to drink, and delicious. Doesn’t sing out, but nice soft fruit and moderate oak. Perhaps slightly dull and a little lean on the palate, lacking a little fruit. Elegant enough, and tangy and fresh. Really quite good. Quite a menthol note to the nose here, with eucalyptus and quite herby notes. Very juicy and fresh, with plenty of bright, crisp, cherry and herb fruit and a light, crisp finish with lots of interest here. More charryness, and a juicy fruit quality. Quite bold and forward, with a more developed character. The fruit is solid and has nice crisp, elegant balance. A nice pinot nose here, with gentle vegetal quality and some truffly qualities. On the palate it has good fruit, with lots of racy cherry and fine tannins. Very fine Pinot expression, with a soft, quite delicate strawberry nose. Nice perfume and earthiness, a touch of damp, autumnal leaves. Lovely smoky, gently juicy fruit on the palate. It has plenty of acidity, but a nice fleshiness. Slightly riper, plummy character, but thick, sweet fruit. On the palate a bit of lightness and elegance, with a racy edge adding interest to a sweet, quiet full palate with good balance. Delicious. A little bit closed at first, but some really lovely fruit comes through here. Fine, floral and truffle notes to svelte, creamy black fruit. Moderate oak. The palate has elegance and depth, with a sily texture and such a refined tannin structure. Soft, yet has presence. Terrific Pinot. Very nice pinot nose, with some truffle and undergrowth and soft red fruits. Lovely sweetness o the palate too, and there is an elegance about this and lovely fruit quality. Very dark, dense colour. Very spicy and earthy, with some meat stock aromas and hints of juicy cherry fruit. A very solid style of Pinot noir, with palate-filling soft fruit and plenty of texture and weight. Juciy and chewy tannins, in a big, but really quite complex style. Cool, slightly subdued nose. Fine, silky tannins on the palate and a touch of chocolate. There is an elegance about this, and a really finely wrought, elegant softness and sweetness. Good balance here, and the fruit on the palate is ripe and rich. The palate has an edge of cherry skin acidity that gives really grippy finish – might age well. Very fine quality here, with a touch of mint and a fine, ripe fruitiness. Very fruity, though not too much. The fruit on the palate is ripe and juicy, with lots of plum flesh and a fine, rounded finish. Silky and tannins ripe. juicy fruit and well balanced. Another lovely nose here, with notes of fudge and toffee over sweet, ripe red fruits. On the palate this has lovely weight and texture, with a silkiness and lovely sweet fruit playing against spicy oak and firm tannins. Not quiet so generous, with an elegance and a minerality, and a in interesting style with some precision about the flavours and tannins. Would like to taste in 5 years. Nice elegance and openness, with a fine-grained, sweet fruit and soft oak qualities. Orangy and open, with plenty of sweetness and a real edge of acidity too. Sweet oak at first, with some good quality to the fruit, and a gently fudgy quality. Good fruit, and quite a lean, savoury edge of tannin ad acidity. From a very inland vineyard, about 100 metres higher than the coast. Very attractive, very Pinot nose – lots of strawberry, lots of truffle and earth, with a touch of vegetal quality. The dark cherry, Morello fruit is lovely. Very fresh, but beautiful quality of fruit. Crop load reduced. There’s a dark, glossy, cherry quality. This is denser, meatier, with plenty of oomph and plenty of sweetness and richness. Massive, velvety, but for me less fine and slightly less enjoyable than the Cellar Selection. Quiet a schisty edge of herbs and spices to really nice cherry fruit. This has good fruit on the palate, where a touch of earthy quality comes through and there is a nice sour edge of acidity. Quite ripe, rich berry fruit, with a deal of acidity and cherryish qualities. On the palate firm and elegant – quite racy and fine, with plenty of vivid acidity and a spicy finish. More toasty and rich, and the nose has a coffee and rich red fruit quality. The palate is fine and very nicely fruited, with a vanillin lick to sweet fruit and a warming toasty and spicy finish. Light bright, a little orangy note and a touch of damp undergrowth. Good sweet fruit here, with plenty of crisp, juicy cherry acidity and an enriching vanillin and sweet fruit palate. A little dank edge to solid cherry fruit. Slight dankness carries through on palate but with a sweet fruit quality and plenty of zest and bite. Rich, a touch of mint and fine meaty fruit. The palate has lovely sweetness – really intense fruit sweetness, and a chocolaty fine tannic structure. Fairly subdued nose, with just a touch of juicy, quiet sour cherry acidity on the palate, and very good vinosity. Lean without being mean, and very attractive Pinot. Light fruit, slightly beetrooty. Rather lean. On the palate some sweet fruit, but a touch stewed. Very bretty, mousy and metallic nose. Fruit on palate spoiled by excessive brett too. Fine, quite mineral nose, with a delicacy about the fruit. A little bit of floral perfume, and nice fruit. Great quality again, if a little tiny bit hollow in the mid-palate. A brief tasting of this as time was against me, but really a lovely nose, brimming with vibrant, ripe black cherries and with a juicy, elegant, mouth-watering style on the palate. This has a rather muted nose, with some slightly baked aromas, and a sweetness and richness of fruit just coming through. On the palate this has really very nice fruit, though it doesn’t quite sing the way the Mount Edward does for example, but has a fine, tangy finish and good fruit. A more expressive, open, cherry-scented nose. Very fine aromatics her, with touches of briar and rich, dry tannins on the palate. There is a touch more dusty austerity about this, but it is a savoury wine, with some elegance and good fruit in to the finish. From the Sugar? Vineyard too, but may or may not make single vineyard bottling. Very concentrated, with quite closed, dark, glossy cherry aromatics. Very concentrated palate too, with lots of grippy acidity and a fair swathe of grippy, nicely roughening tannins. Promising. Creamy, dense, rich nose, with full rich fruit and a slightly baked quality. On the palate nice sweetness, with a good quality of ripe sweet fruit, and plenty of earthy, rich Pinot character. Good quality here, and a fine, quite generous acid tannic structure. A tiny bit of sulphur blows off to reveal spicy, quite rich fruit on the nose, with a richer more round and open quality than some 2004s. Palate has richness and generosity, but a slightly hollow mid-palate, with not quite the sweetness and fullness of fruit. Finish is slightly disappointing. Intense cherry with plenty of concentration, if a slightly raisiny, stewed prune quality. On the palate there is a mass of concentrated plum and prune fruit, with plenty of concentration and a damson-plum, bitter skins bite in the finish. Very impressive, but perhaps lacks a touch of the pinot character of the 2003 for example. Lovely cherry and charred wood melange, with some real elegance. A touch of rounded, creamy oak quality and sense of minerality. On the palate this has beautiful fruit. Lots of ripe, rich, rolling red fruits and a real juiciness and lightness of touch. Notes of chocolate and ripe tannins make for a precise but generous finish. Very juicy, schisty, firm black fruit quality. Lots of concentration here, but an underlying sweetness of fruit. Lovely palate suggesting a bright future: fruit has really come through, with more sweetness and generosity than some. Lovely tight, suave, polished aromatics here, with polished dark fruit qualities. Ripeness and richness here, with masses of good quality fruit on the palate. Very dense and creamy, terrific mouthfeel and very precise, creamy qualities with a backbone of tannins and supple, integrated acidity. Owned by Archery Summit, Oregon. Looking for UK distribution. Generous, vanillin-edged sweet fruit, with a little mellow earthiness and plenty of rich, ripe fruit aromatics. On the palate it is mellow with a cherry quality and slightly Beaujolais Cru. Morgon-like minerality and dry, slightly dusty character into the finish. A touch pruney, with dark, raisiny character and slightly jammy aromatics. Lots of cherry skin and bitter0edged liquoricy character on the palate. There is good concentration here, and juicy cherry acidity with fine tannins. Concentrated and impressive, with lots of dark, savoury notes, if perhaps slightly dense. Certified organic since 1996. Rich, flavoursome, slightly meat-stocky aromas, with a baked quality to the fruit. Good quality to the fruit on the palate, though it too suffers from a slightly muted fruit expression. Far more charry, toasty oak on the nose, with decent cherry fruit and a touch of schisty minerality. The palate has decent fruit, with a sweet cherry quality and a fine, bitter, plumskin and liquorice edge. This has good fruit and balance, but perhaps needs a little time to mellow out a closed, quiet up-tight character. Rather sweet, acetone, perhaps Malolactic character. The palate suggests a good, rich, ripe quality of fruit and plenty of concentration. Distributed by Ellis of Richmond. Lovely generous pinot character, with smoky, seductive oak and a generous strawberry and fine, earthy fruit character. The palate has lovely fruit, with very fine sweetness, and a delightful richness on the palate. The acidity is keen and grippy, which along with a roughening edge of tannin and fine concentration makes for a delightful balanced, yet concentrated wine. More closed and concentrated, with a firm, glossy, tightly wound cherry fruit. Background smoky oak is well judged. ON the palate a wrapping of sweet vanillin oak does note overpower the ripe, glossy fruit a that powers through, delivering plenty of cherry and kirsch, violet and aromatic Parma violet fruit and a long, concentrated finish with good tannin and acid structure. There’s a smokiness and charry quality about this on the nose, with an underlying softness, but concentration of red fruits. A touch of dried herbs and earthiness adds complexity. Very nice fruit here, with elegance and power, and a lovely structure. Very promising. Beautiful fruit sweetness, with haunting cherry aromas, soft floral nuances and a truffly, undergrowth quality. Lovely cherry fruit – very crisp and taut, with a minerality and a great deal of orange and clove, with little chocolaty hints and terrific length and sweetness. Beautiful Pinot. Very nice schist and cherry, charcoally edged fruit. Quite kirsch-like. Far less generous than the 2003 aromatically. The palate has quite crisp, clean, delineated fruit with a touch of dry, lipsticky quality and the oak sitting rather on top. A good wine, with sweetness of fruit coming through, and quite a fine tannic quality. Barrel sample. Tight, schisty, quite concentrated red fruit aromatics, with a little rose-hip note. Good fruit and concentration on the palate, and the quality of the tannins seems good. Very promising indeed. Morris & Verdin. Lovely charcoal and schist notes, with plenty of smoky notes and fine Pinot nose of earthy, slightly truffly red fruits. Beautiful cherry and ripe red berry fruit on the palate, with a fine quality of soft, generous sweet fruit and supple, quite chocolaty tannins. Excellent balancing acidity too in a long finish. Excellent. Slightly more closed and meaty character on the nose. There’s a suggestion of dryness and inkiness about this. Rather dry quality on the palate. A certain toasty, espresso quality of oak comes through, and dry, rich fruit. Actually, this is very well managed, with the fruit coming through a little more and a nice, rich, supple tannin quality in the finish. This has a tight, mineral, schisty quality to the fruit at first, and has very fine character. On the palate a definite minerality, and the concentration here is good, with a deal of fine, ripe tannic structure. Very promising indeed. Trying to get more organic activity into the vineyards, earthworm activity and so on, as the land has been planted before. 30% new oak, blend of coopers, but all medium toast. A touch of vegetal, beetrooty flavour, and plenty of black fruit and a fine cedary, gently chocolaty oak coming through. Lovely mouthfeel, with fine, very pert black fruit. Good fruit quality and mouthfeel, with a fine Pinot character, and plenty of cherry and plummy, black flavours. Barrel sample. Wine will spend 15 months in oak. Extremely dark, crimson-edged colour, but not dense. Nice juicy cherry and rich, red fruits, with a wrapping of toasty oak already sitting nicely beneath the fruit. The palate has a very fine, ripe, but crisply defined fruit quality, with a real juiciness and pert cherry and kirsch-like fruit. Lovely grainy tannins and clean, bright acidity add up to a very appealing picture and a very promising wine. Lay & Wheeler. Very fine minerality about this wine, with delightful schisty aromatics, damp earth and haunting Pinot character. On the palate this has lovely elegance and sophistication, with a balanced palate of dry, herb-tinged red fruits, silky tannins and a fine acidity into a long finish. Slightly more baked and plummy quality, with a touch of schist and cherry brightness to the fruit coming through. On the palate quite a fine black fruited palate, with some cherry and plum skin bitterness that sits nicely with the fruit. Good acid structure, but perhaps suffers from a slightly drying fruit quality. Dark, very concentrated chocolate-tinged nose, with a dark damson skin quality. Excellent ripeness and richness on the palate, with obvious concentration and a liquorice-edged, juicy cherry fruit quality. This is very promising. Patrick and Charles distribution. Nice coffee and warm fudge oaky notes at first, with a solid, vanillin and ripe fruit generosity to the fruit. On the palate a good solid core of cherry and focused, slightly lipsticky fruit, with very dry tannins and a warming wrapping of mellow oak. Very nice nose – earthy and soft, with a gentle strawberry fruit and a wrapping of tobacco and mellow oak. On the palate there is a nice red plum and orangy fruit and acid quality, with a rounding out of quite toasty, coffee oak and silky, dark tannins. Quite a tight, fine nose, with good quality of fruit, and a certain brightness and elegance. Good cutting acidity o the palate, with a touch of chocolate and fine tannins, and leads into a solid, well-balanced finish. Little bit of coffee and char, with fairly solid, ripe red fruit. The palate betrays a little lack of flesh, with very good fruit and decent sweetness, but the total package is a little lean. Intense mineral and cherry, with a concentrated lean, savoury cherry fruit and plenty of crisp, slightly paintboxy Cru Beaujolais quality, with a plummy dry fruitiness.